Restoring a WW2 Jeep can be more time consuming and more expensive than you may think. Our advice is to buy one that is mechanically good, with a Willys or Ford engine the correct gearbox and axles, as these can be expensive to replace and repair. Axle rebuild,s could cost you more than £1000 each, an engine rebuild could be could be anywhere between £2000 to £3000 maybe more depending on condition. A replacement rebuilt engine ex French army is about £4500. The chassis should be in good condition or easily repairable. Most of the body parts can be replaced or repaired. If you buy a project that is a runner and drives OK for say £7000, you could spend another £4000 to £6000 on parts and equipment. Then you need to factor in any labour costs you may need to pay for. 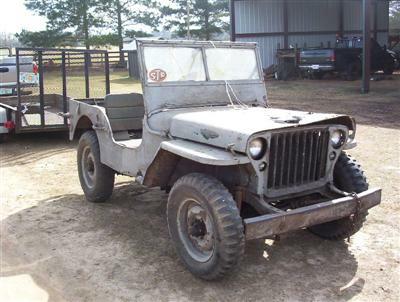 If the Jeep you are thinking of restoring is a wreck with a non running engine, you must assume that you will need a complete rebuild of engine, gearbox, transfer box and both axles. You are looking at a cost of in excess of £9000 for just these parts, without the approx £6000 for body parts etc. The Jeep may look cheap at £3500, but add all the other cost’s plus any time and labour and the end result could well cost you more than an already restored Jeep. Do your homework before you buy. Make sure you are going to end up with the type of Military Jeep you will be happy with. Don’t buy the first Jeep you see, take your time. Go to more than one supplier of Jeeps in need of restoration. If you are unsure of the cost of repair, take some pictures. Send them to the suppler of Jeep parts you intend to use for some guidance.